As a young violinist, growing up and studying at the Moscow Tchaikovsky Conservatory, Levon Ambartsumian witnessed what might be called the Golden Age of Soviet violin playing. He studied with Leonid Kogan and Igor Bezrodny who shared First Prize with Julian Sitkovetsky at the first post-war competition in Prague in 1947. It was also the era of Gidon Kremer, Victor Tretyakov and Vladimir Spivakov. It was Kremer who encouraged Ambartsumian to include music composed by his Russian contemporaries in his recital programmes. The violinist’s many recordings – some as conductor of, or soloist with, the Moscow Chamber Orchestra which he founded in 1989 – have often presented works by Alfred Schnittke, Pēteris Vasks, Alexander Arutiunian, Mikhail Bronner and Alexander Tchaikovsky. For this disc the Armenian violinist has reached back further into the Russian repertoire of the twentieth century, to music for violin and piano by Sergei Prokofiev. And further back into his own career, too, for the First Sonata was recorded some years ago, in Moscow. It was the rediscovery of a DAT tape, thought to be lost, that prompted Ambartsumian to gather together these past recordings of the First and Second Sonatas alongside a new recording of the composer’s Five Melodies. As listeners will no doubt be aware, not all three works began life as compositions for violin and piano. The Sonata No. 2 in D is a transcription of the composer’s 1943 Flute Sonata; the new arrangement was premiered a year later by David Oistrakh and Lev Oborin. The Five Melodies were originally composed for Russian mezzo-soprano Nina Koshetz, who premiered the vocalises in New York in March 1921. Four years later, Prokofiev re-arranged them for violin, with guidance offered by the Polish violinist Paul Kochanski, who gave the first performance. The two sonatas conjure diametrically opposed worlds: the first sombre, stark, driven by anxiety and anger; the second bright, polished and marked by elegance, wit and ease. The opening of the Andante assai of the F Major sonata is weighty (the composer’s dynamic marking is piano). The bare piano octaves and gritty violin G-string trills inject a looming ominousness, evoking a barely supressed brutality which is enhanced by the growling oscillations in the piano’s booming depths. Ambartsumian displays rich power in the double-stopped oratory, but also melancholy grace in the searching melodic lines. It is the contrast between this otherworldly elegance and the thunderous fifths motif in the piano bass which is so troubling. We are offered some lightness when carillon chords support the violin’s racing scales, but Ambartsumian’s feathery spinning is eerie rather than ethereal. There is nothing ethereal, however, about the spiteful stabbing which opens the Allegro brusco: instead there is sarcasm, bitterness and defiance worthy of Shostakovich. Ambartsumian wonderfully digs into the grain of the string. Then he embarks on a melodic argument which seems to dare the piano to silence it, its dotted rhythms a bravado snub, and which eventually breaks free, racing in a toccata-like spinning line, full of confidence. There is gentleness of gesture too, though, and when the two instruments do finally come together, the sparkling trickles of Alexander Ardakov’s beautifully spilling piano accompaniment seem to inspire the violin to pick them up and carry them aloft to the stratosphere. The piano’s running sextuplets in the Andante are a ghostly thread, above which the violin’s melody searches in beautifully shaped lyrical excursions. Ambartsumian’s tone is gentle and consoling, both narrowly centred and emotively resonant. There is a hypnotic otherworldliness about the repetitions, extensions, oscillations and echoes. The players effectively balance Stravinskian abstraction and Romantic feeling. The final movement is exuberant but not exactly merry: there is an edge of anxiety even when the gestures are at their most perky. 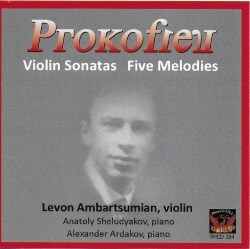 Matching snappy staccato in the piano, Ambartsumian’s pizzicato has real bite and precision; one senses that the violinist appreciates exactly what Prokofiev was trying to communicate through his exploitation of different violin techniques. As the variations unfold, anger returns, as do the scurrying scales. Paradoxically, the wisps both trouble, with their restlessness, and console with their delicacy. The darkness is brushed aside by the fluency and clarity of the first theme of the D major sonata’s Moderato. Ambartsumian’s silky tone and the understated elegance of Anatoly Sheludyakov’s accompaniment immediately assuage the previously evoked apprehension and anger. The players’ attention to detail is admirable: every accent, dynamic and comma is observed and judiciously delivered – and here such accents suggest vivacity rather than viciousness. I could literally feel the melodiousness relaxing neck and shoulder muscles that had tensed during the First Sonata! The development section generates joy and excitement as the lyrical theme and spiky triplet gesture compete animatedly, before Sheludyakov’s skilfully puts on the brakes in the transition to the return of the first theme. The Presto seems to skate and twirl on air, though the scurrying does not lack for precision and bite, and there is a winning boldness about the extravagant leaps of the second theme. The contrasts of sweet lyricism and mercurial flightiness in the slower central section seem to deliberately tease the listener and when the opening episode is reprised, the pinging pizzicatos and clanging piano accents issue a cheeky thumb-of-the-nose as the music races away. Ambartsumian is quite restrained in his use of vibrato in the Andante. That creates a cleansing freshness, but also means that when vibrato, and the slightest portamento, are applied, they make an expressive mark. The improvisatory, jazzy chromaticism is magically mellifluous, but Sheludyakov nudges us from our reverie with his sensitively assertive reprise of the theme. One senses that the players are having a good time in the Allegro con brio! Which just leaves the Five Melodies. The Andante has a strong sense of direction and a persuasive pulse, despite the movement’s somewhat inconclusive close. The duo push forward, propelled by the piano’s rocking accompaniment, through the Lento which is definitely not ‘troppo’ but which has melodic confidence and character – an assurance which explodes exuberantly at the start of the Animato, ma non Allegro, before it is halted by more reflective ruminations. I may be wrong (my own edition of the Melodies is perhaps not definitive or accurate) but I think that Ambartsumian alters the register of some of the violin’s lines in the Allegretto leggero, taking them up and down the octave, as well as stealing some of the piano’s insouciance at the closing cadence: but, if so, such liberties certainly make for lightness and light-heartedness. The concluding Andante non troppo showcases Prokofiev’s lyrical pathos alongside his irreverent vivaciousness: it is a beautiful summative miniature. There are many recordings of these work from which to choose. The purchaser of this recording can be assured of enjoying Russian masterworks delivered by a master from the Russian tradition.